People's Liberation Army Navy special forces involves in military exercises at China's overseas garrison in Djibouti: Photo SCMP. The exercises in Djibouti that began on Friday involved dozens of officers from various naval task forces and took place at the country’s national gendarmerie training range, the People’s Liberation Army Navy said in an online report. Troops arrived at the base, which is China’s first overseas garrison less than two months ago and the drill was meant to test the personnel’s capacity to handle a range of weapons and tasks in extreme heat, humidity and salinity.Troops at China’s first overseas military base have completed live-fire drills for the first time. the report said. According to the source, the drills involved dozens of troops and took place at the training range for the country’s national gendarmerie. The first Chinese troops set sail for the base from the mainland China in July. The Xinhua state news agency said its establishment followed “friendly negotiations, and accords with the common interest of the people from both sides” between China and Djibouti. The strategical map of Chinese overseas garrison and U.S base (Camp Lemonnier) in Djibouti, Africa. 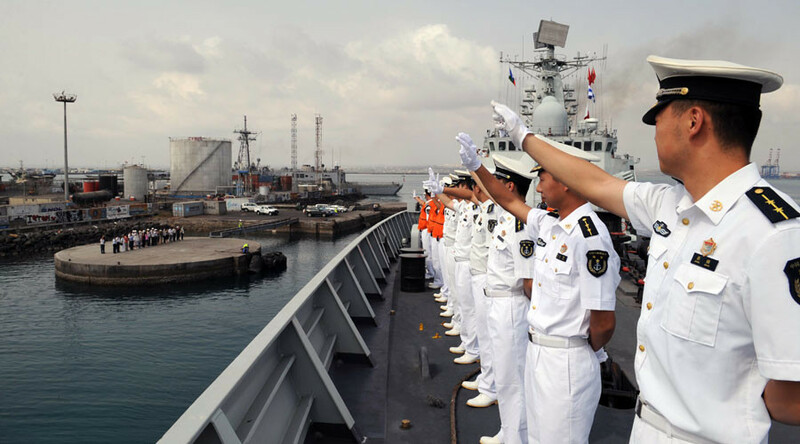 PLA Naval officers salute-bye the local Djiboutians while on sail to overseas base. "The base will ensure China’s performance of missions, such as escorting, peacekeeping and humanitarian aid in Africa and west Asia,” it added. China has emphasized its contribution to U.N. peacekeeping efforts in Africa and depicted the base as something that would help it build upon this work." The source revealed. But the military move into Africa also accompanies growing economic influence in the region. In 2015, the Chinese government pledged to spend $60 billion on infrastructure development include military, security,political and economical within the African continent. In its expansion of Chinese influence, to push into Africa mirrors the Asian “One Belt, One Road” plan that has seen China drop billions on regional trade routes within its home continent while increase the presence in part of Africa. The Science and Tech weblog, is about science,technologies,esoterics and international interest since this story is touching our African continent, then this information is worth for sharing!